This entry was posted on Friday, March 4th, 2011 at 6:25 pm	and is filed under health. You can follow any responses to this entry through the RSS 2.0 feed. Both comments and pings are currently closed. Do have a holistic vet that you can recommend near Glendale, CA? I don’t know anyone personally in that area. You could try using this tool on the IVAS (internation veterinary acupuncture society) website to track someone down. As a western veterinarian reading your site, I would like to clarify a point for your readers. There are four stages of kidney failure and high protein diets are fine for stages 1-3. However, in stage 4 renal failure, I completely disagree with your opinion regarding high protein vs low protein diets. The reason for restricting protein has little to do with phosphorous as you argue. Instead, It has to do with controlling the BUN (Blood Urea Nitrogen). BUN is a toxin normally excreted by the kidneys, but in stage 4 they are unable to do so. What is BUN? A direct product of protein breakdown. Since stage 4 kidneys can not properly excrete BUN in stage 4, it is imperative (in my opinion) to restrict protein in the diet thereby preventing BUN from being formed. Phosphorous restriction is important too, but this is not why the k/d diet is recommended in the final stages. I hope your readers will study the matter carefully and make their own informed decisions. Thank you for your comments. There are many different opinions out there on protein restriction and renal failure in cats. I welcome discussion on this site. And I always encourage my own clients to work with a western vet along with me. Most of the western vets I work with are fully accepting of the high protein diets I recommend because they have seen the animals I work with do better and in many cases also seen the numbers drop. Have you found that most of your stage 4 cats will eat K/D? I have found most cats in late end stage renal failure have a very poor appetite and it is hard to get them to eat anything, let alone K/D. I’ve had folks struggle with just feeding K/D and having their cats not eat it and then feeling bad if they end up feeding human food (usually chicken or fish) because their vets have said K/D is all they should eat. In stage 4 I am happy if the cat is eating anything, they need to eat and usually don’t. I don’t think I have ever had a stage 4 cat that would eat K/D. 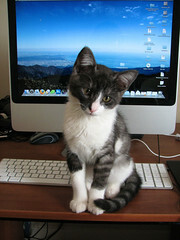 While I admit that usually I am working with cats in stage 2 or 3, I also occasionally work with stage 4 cats. Most of the cats I work with I can move down a stage and I have had a number of cats that I have moved from stage 3 to normal renal values. Western medicine says once those cells are gone – they are gone. I believe this is not true and that there is sometimes just not enough blood getting into the kidneys for full function. There is no way I can increase blood flow without high protein. Many of these cats are also anemic. There is a large connection between anemia and prognosis: if you want longevity you need to reverse the anemia. Once again I can not do this without high protein. So when I do work with a stage 4 cat I am hoping that I can reverse them down to a stage 3 or 2 cat quickly. I can often drop creatinine by 0.5-2 points in one or two acupuncture treatments over about two weeks time. They also just feel a lot better and start eating. If I can successfully drop stage 4 cats to stage 2 or 3 how do you feel about the high protein? I fully admit that I can not do this in every cat. I think in some there is just too much damage. However I am holding out for actually reversing stage 4 in the cats I work with. I am not just trying to manage them. Life is pretty bad in stage 4. I need high protein to have any ability to reverse damage. I think this may be a large difference on how we treat this disease. In addition all the cats I work with are also getting acupuncture, which I highly recommend for renal disease. The acupuncture is helping with blood flow, regulating blood pressure, and helping to increase filtration of toxins in the body. TCM has some mighty tools for this disease that are much different then what we have available in western medicine. This may also be a difference between the cats you have works with and the ones I have treated. While I put up articles on my site to make sure people know there are other options out there for their animals, I always recommend that they find a vet to work with in their community. There are certain animals who I do not recommend high protein for – especially those with inflammatory kidney disease, which some stage 4s are. However I do not ever recommend K/D which I find to be rarely eaten and of poor quality. Once we move them to ischemic disease then I recommend high protein again. So we may actually be on a similar place in most cats on this one. It is another reason I recommend that people have a holistic vet who knows their cat on board. The most important things to me in treating this disease is that my patients feel better. I have found that usually I can significantly improve quality of life in 80-90% of the cats I work with. That is no small thing. Thank you for taking the time to add your comments Margo. I appreciate it. My cat is 18 yrs old and diagnosed with kidney failure just a couple of years ago. She is doing pretty well, but has lost lots of weight. We have been putting tuna water or chicken water (diluting tuna and chicken to a watery state) to keep her interested in eating. Of course she continues to lose wt. She is okay with the KD diet from Science, but obviously needs some more calories. Tonight I watered down about a 1/2 tsp of raw grass fed bison and soaked her dry K/D in that. She loved it! But is this a wise choice for her? She used to vomit, but has stopped since we’ve stopped giving her canned K/D or other canned foods. I hate to see her wasting away. If she is losing that much weight something needs to change. In most cats I like adding in some extra real meat protein, go slow so you can see if she has any problems with it. From my experience cats do better not on K/D. Of course I don’t have your cat’s case in front of me so it is hard to say what the best course is. If she starts vomiting again they obviously you need another choice. I look at their energy, attitude and weight to determine if we are going in the right direction. I often find the most vomiting is in cats on dry food. Personally I think in a cat wasting away you feed them what they will eat that doesn’t come back up. Hope this helps and that she gains some weight back. I’m leaving tomorrow and will not have computer access for a week. 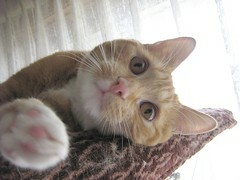 Thank you for your response, I have since tried Sox on some of the recommended foods and so far so good. Now that she feels better, I have to watch out for hairballs because she is grooming again. She really likes the Weruva chicken w/gravy and is crazy about the Instinct Rabbit formula. 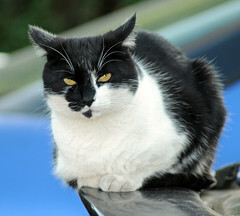 My accupuncturist, not a vet, feeds her cats the Evolution Diet and they look amazing and are very healthy. Any thoughts on that–it is completely plant product, but claims to have all the protein cats need. I personally am strongly against feeding cats a vegan or vegetarian diet. I have just found that long term these cats do not do well. Even my vegan clients feed high meat diets. Cats have a very short digestive tract and are made to process meat, naturally their diet (wild cats) is mostly meat. I looked up Evolution and it is also very high in wheat and corn which are common allergens to many cats. Most young cats look well no matter what they eat, it is what happens as they age that counts. 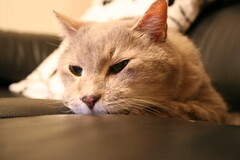 My cat is nearly 19 and has recently been diagnosed with stage 1 kidney disease. I’m based in NZ and haven’t been able to find any holistic vets or herbalists locally, and wondered if you would consider a phone consultation or could point me in the right direction to find some one? I can get the test results from my vets. We have tried my cat on K/D and she refuses to eat it. At the moment I’m trying to feed her a low phos, partially raw diet, consisting mostly of egg, tuna, chicken, and adult science diet until I have a better idea of what to do. There’s a LOT of conflicting information. I believe Ihor Basko does phone consultation anywhere in the world http://www.drbasko.com/site/services/. In addition if you put in New Zealand into the IVAS vet search on the right side of the screen , here is the link http://www.ivas.org/vet-search/ , there are three acupuncture veterinarians in New Zealand – hopefully one of them is close enough to see her in person. I’m not sure she would allow acupuncture, she’s very… strong willed. We struggle to get a single butterfly needle in for blood tests. I’m particularly interested in herbs, supplements and diet options, though I would be prepared to try acupuncture provided it wasn’t putting a lot of stress on her. Many of the IVAS vets are also herbalists and can consult on nutrition. Ihor could also probably do that over the phone – I don’t do phone consultations myself although working with someone closer would be better. You could also do some infrared light therapy with her. http://pathwithpaws.com/blog/2012/10/20/infrared-light-therapy-for-kidney-failure-incontinence-and-arthritis-in-dogs-and-cats/ That can help a lot with kidney issues. I have also been surprised over the years with acupuncture and cats, most of them really like it, even the strong willed ones. I don’t restrain at all with acupuncture and they get in sit on the couch and just enjoy it. I am so glad I found this blog post. My 13 year old cat went into the Vet about 9 months ago because she was throwing up all the time. They did a blood panel and kept her for 24 hours to do a kidney flush of some sort and told me to feed her low protein food which she would not eat. She’s back to vomiting about every other day now. I just asked the Vet to send me her blood panel results from last year and as you say in the Inflammatory kidney disease section, her kidney numbers were just barely elevated (creatine 2.1) and her cholesterol was really high (238). She has a fairly decent appetite and is happy and playful. Her only issue is the vomiting. I’ll try out a moderate level protein food and see if that helps before I spend another $500 at the vet. I’ve been trying to feed her grain free, but not moderate protein.